Ahead of the Russian President’s visit to Shanghai on Tuesday, Chinese and Russian naval vessels have rallied in the northern part of the East China Sea and are set to conduct a joint military exercise, the “Joint Sea-2014” from May 20th to 26th. Heads of both the Chinese and Russian naval forces taking part in the joint drill said Sunday that the exercise was aimed at improving their capacity in coping with maritime security threat. Navies of the two countries will exercise defense and attack, escorts, search and rescue and the freeing of hijacked ships, among other actions, officials said. 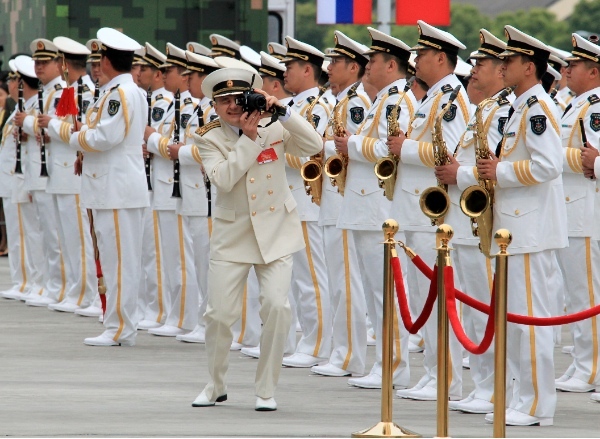 Outlining details of the drill, Tian Zhong, deputy commander of the Chinese Navy and the Chinese director of the exercise, said unlike the previous two joint drills, all Chinese and Russian naval forces participating in the “Joint Sea-2014” will be integrated and not segregated on national lines. In addition, submarines and surface ships will confront each other during the drills, said Zhong. A total of 14 surface ships, two submarines, nine fixed-wing warplanes, six shipboard helicopters and two operational detachment-alphas (ODAs) assembled in Shanghai on Sunday. “With more united, integrated and real combat conditions, the drill will improve the two navies’ capacity in dealing with maritime security threat,” Zhong said. A Russian Pacific Fleet squadron, led by the guided-missile cruiser Varyag, sailed from Vladivostok on Wednesday. Both China and Russia dispatched capital ships, including China’s Zhengzhou and Ningbo missile destroyers. The Russian Fleet, also including the large anti-submarine ship Admiral Panteleyev, and the large amphibious ship Admiral Nevelskoy, passed through Tsushima Strait Friday, where they carried out an anti-piracy exercise. The crew of Varyag honoured Russian sailors who died during the Battle of Tsushima against the Japanese Navy in 1905. The drills will coincide with the Russian President Vladimir Putin’s arrival in Shanghai to cement economic ties with “ally and friend” China. The two countries are set to ink a record number of cooperation agreements.